Copenhagen is designing resilient architecture that withstands the effects of climate change, destructive cloudbursts and flooding without sacrificing public space. the park, Enghaveparken, plays a key role when cloudbursts hit the Vesterbro area in Copenhagen. The park, designed with its history, architecture and visitors in mind, has the capacity to hold 24,000 m3 of water. During periods of heavy rainfall, the recreational areas gradually flood as the water rises. At the entrances, sluices are constructed in the form of dikes that rise by simple mechanics when the park is underwater, and depressions to ensure that large quantities of rain are kept within the park. This adaptation also includes a large dike surrounding the park, collecting rainwater from the park and nearby rooftops and buildings. This water is circulated around the park via the central water garden and along the dike. The water will be treated biologically through an active planting bed. The park further utilizes a large amphitheater to hold water, which functions as a social space under normal circumstances. As a whole, the park’s design is based on sustainable principles, which boost biodiversity and provide a wide range of recreational spaces. The adaptation measures have turned water into a resource to improve urban life and create added value in a popular park. As part of Copenhagen's cloudburst plan, the park will be able to protect the area from a 1-in-100-year flood. Through the many improvements, Enghaveparken supports an active outdoor urban life which benefits the community, while delivering improvements to public health and quality of life. 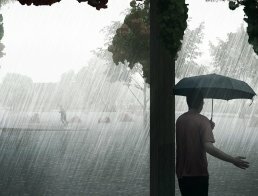 Enghaveparken is designed to retain 24,000 m3 of water during a cloudburst or heavy rain. This water does not add pressure to already flooded areas, making it a solution for climate adaptation. The improved green spaces, insects and bird houses contribute to improve the city’s biodiversity, while allowing its visitors to explore local nature and ecosystems.